But what about a poorly performing teacher who simply hasn't the repertoire of experiences or skills upon which to refer to? New techniques must be taught to this person. Technical solutions in the form of exceptions are not present. And even if so, would take far too long to extract and shape into a successful behavioural solution. So, what happens in a Solution Focused framework for the learning on new skills? Hi Oliver, thanks for your question. This model is intended for solution-focused helping which is used in coaching, counseling, therapy. I'd like to make two comments in response to your question. 1. I agree there is nothing wrong with teaching someone news skills. This may be especially valuable when the other person is relatively new to a certain domain and when the person is open to be taught. By the way, teaching, too can be done in a solution-focused manner (perhaps more about this later). As you see, I agree with your point. 2. Having said this, the SF-helping approach may have suprising power even when people are relatively unexperienced. A reason is that there will probably be experiences in the person's past which may be to some extent comparable to what s/he now has to do. Someone may not previously have had to change his/her teaching style but s/he may have experience with changing some other important aspect of his/her functioning in previous jobs, or even as a student. Love the flow chart. I tried this kind of thinking with a group of 30 people last night. We had 3 hours to come up with a plan to revive a town's economic state. The session went well, except for a few of the event sponsors who kept re-surfacing their skepticism. 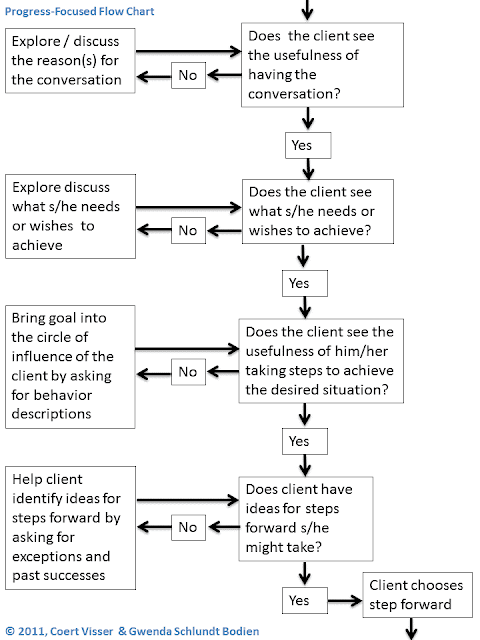 The flow chart makes it clear to me how to slow down for the skeptics when working with a group.